f you see "Nullsoft SHOUTcast Source DSP v2.3.2" in the right panel, then you have correctly installed the SHOUTcast Broadcast DSP Plug-in. Address: Here, you need to enter the server IP that was given to you in the welcome email you received. Make sure that you put in the proper server IP, or else you will not be able to connect. Port: In this field, you need to enter the port that was given to you in your welcome email. It should contain 4 numbers. Once again, this must be set properly or else you will be unable to connect. 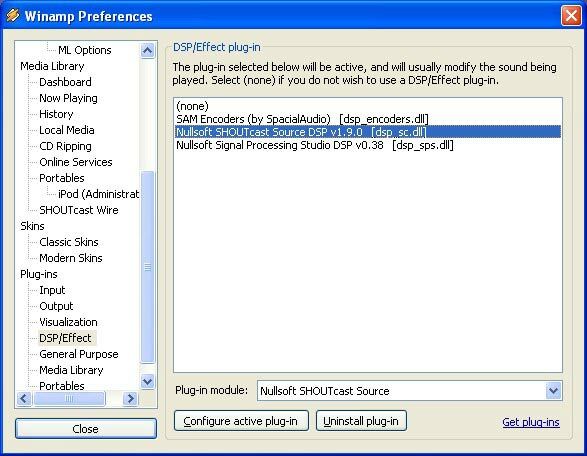 Encoder Settings (select streaming audio format) and Select the "Encoder" tab at the top of your DSP window.